I’m an insomniac by choice – especially when I travel. My philosophy: There’s too much to see, do and eat to worry about putting in five or six (or more) hours sleep each day. Atlanta is a great city for insomniacs. 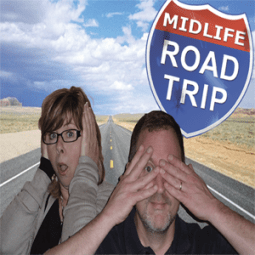 Many nights, whether it’s my caffeine addiction, jet-lag, or just pure adrenaline from one of my upcoming Midlife Road Trip adventures with Sandi, I find myself unable to sleep. When this happens, I venture into the city, in the name of research, to explore opportunities for other insomniacs visiting my home town. Here are some of the late-night destinations I like best. Just north of Midtown Atlanta, the Buckhead neighborhood is *the* chic, trendy, and upscale hotspot for nightlife in Atlanta. There are more bars and clubs here than anywhere else in the city. Not surprisingly, this also happens to be the part of town where many celebrities and athletes come to get arrested for disorderly conduct (so you know it’s a happening place). Viewfinder Tip: Dress codes are enforced strictly at nightclubs in Buckhead, so be sure to wear closed-toe shoes and no baseball caps. Krispy Kreme Donuts, on Ponce de Leon Avenue, is a must for insomniacs. They are open 24/7 and have a large viewing window where you can watch ‘em make the donuts. It’s quite fascinating. And the donuts are great for a midnight snack. Sister Louisa’s place isn’t actually a church, but instead an irreverent church-themed bar featuring the art work of bar owner Grant Henry’s alter ego, Sister Louisa. The “Church,” as it is called by the regular “parishioners,” features a full bar, good eats, a jukebox, a ping pong table and the world’s only confessional/photo booth. If you’re there on a Wednesday night, participate in Church Organ Karaoke, a Sister Louisa spin on karaoke during which all performers are required dress in choir robes, and everyone is accompanied by a real church organ. It is, in a word, a trip. Bowling always is fun to do after dark, and Midtown Bowl is open late, has an impressive full service bar, and a bunch of bowling lanes to boot. The regular food menu here includes breakfast items and fried okra. An Atlanta landmark, the Majestic Diner on Ponce de Leon has been in operation 24/7 since 1929. I love that you can order anything from the menu at any time of day or night. It has a retro feel and is like taking a step back in time; the food is good, the portions are substantial and the prices are fair. Adjacent to the Majestic Diner is Atlanta’s oldest theater, the Plaza Theatre. For more than a decade, this theater has been showing the cult classic, “The Rocky Horror Picture Show,” every Friday night at midnight. What’s unique about this showing is that a live cast acts out the movie on stage while the film is projected on a screen behind them. Audience members are encouraged to dress up and participate and join the fun. What do you do when you’re on the road and you can’t sleep?